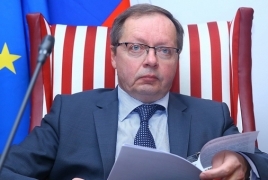 PanARMENIAN.Net - Russia has no reason to not trust Armenia, Andrej Kelin, Director of the Department of European Cooperation at the Russian Ministry of Foreign Affairs said in an interview with the Komsomolskaya Pravda. Kelin remarks came in response to a question about the involvement of the closest allies of Russia in the CSTO and the EAEU - Armenia and Belarus - in the Eastern Partnership program. When asked whether the West is trying to sever the countries in question from Russia, Kelin said: "We regard the Eastern Partnership as a very ambiguous initiative, which we constantly point out to both its initiators and participating countries. "Of course, despite all the “beautiful words”, the real background of its (the program's Ed.) launch by Brussels leaves no room for illusions. "And we can fully observe the consequences of such attempts to put countries close to us before the choice of “being with Russia or the West” on Ukraine." According to him, Russia, at the same time is sympathetic to the interest of Armenia and Belarus in participating in the program, which they see as an opportunity to promote cooperation with the European Union and "ensure the sustainable development of their economies." "They are our reliable allies, and we have no reason to not trust them, ”added Kelin.